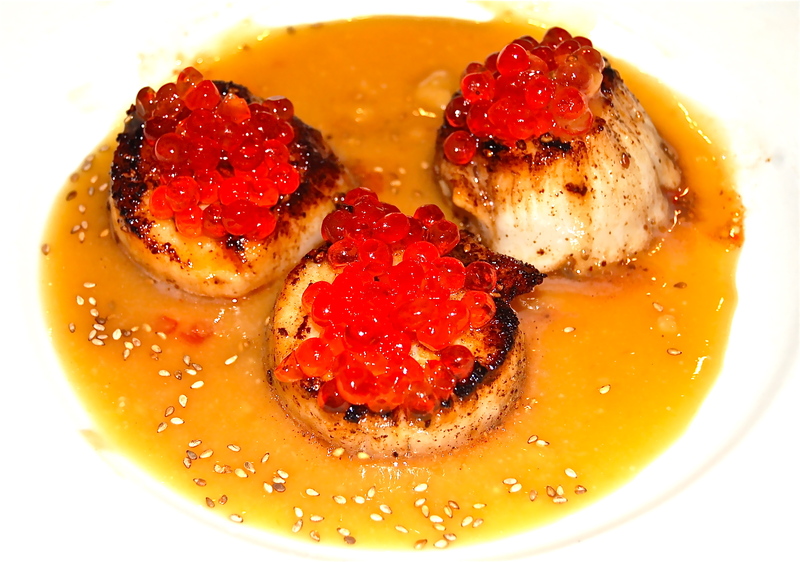 Diver Scallops really show themselves off when accompanied by delicious additions. What can better accompany them than Salmon Roe, Miso Sauce and Toasted Sesame Seeds? Well the last time, we paired them with Coconut Milk and Ginger Sauce, and before that with a Basil Mayonnaise Sauce. Both were equally delicious partners. Divers are a notch above what fish counters refer to as Sea Scallops. A taste of the sea actually permeates the plate. 1. Prepare the Miso Sauce by combining the Sake, Mirin, Miso Paste & Sugar. Whisk them into a smooth sauce. Set aside to be heated before plating. 2. Season the Diver Scallops with the Sea or Kosher Salt & White Pepper. Refrigerate until 1/2 hour before serving time. 3. Lightly toast the Sesame Seeds in a small pan. 4. Heat a saute pan to medium. add the EVOO & the Butter. When the Butter stops sizzling gently add the Divers & saute for a few minutes or until they have developed a brown crust. Turn & saute for another minute. Remove to a platter. 5. To assemble, gently heat the Miso sauce and spoon a pool of sauce onto a plate. Carefully add three Divers & top with the Salmon Roe. Sprinkle Sesame Seeds into the Sauce.